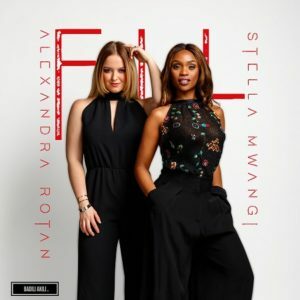 Kenyan-Norwegian highflying artiste, Stella Mwangi has collaborated with a Swedish, Norwegian based songstress called Alexandra Rotan who is currently her musical partner in the on-going European song competition called Melodi Grand Prix 2018. MGP (Melodi Grand Prixx) is the Norwegian selection of Eurovision Song Contest, also known as the biggest music show in the world. MGP airs on the national television channel NRK1, and the television broadcast is seen by 1.3 million people with a share of 73 %. In addition to that there will be web-stream, social media and radio coverage. The event also gets an incredible amount of attention in the press over a time span of weeks and months. Stella Mwangi as you probably know made waves and a lot of positivity when she participated back in 2011 with the song «Haba haba». Marking Norwegian music history as the first African woman to represent a Scandinavian country in Eurovision with a swahili record. Stella Mwangi and Alexandra Rotan have done the song «You Got Me Going» by a team from Sweden – http://spoti.fi/2DEqi7O which is competing for 2018 Eurovision Song contest winner title. Alexandra Rotan. The lead vocalist for the world famous artist Alan Walker is keen on chorus lines, while Stella Mwangi delivers superb rap verses. F.I.L (Fall In Love) released under Stella Mwangi’s independent record label Badili Akili was whiten by Stella Mwangi and produced by UK based Nigerian music producer and DJ, DJ Chopstixx.